Miss Fortune slot machine from Playtech takes us to the world of the classroom of the magical Miss Fortune. The mobile slot has a very healthy max jackpot of 5,000x and an incredible four main features. The first is the Crystal Ball Re-Spin feature, there are two free spins features offering unlimited free spins, and the fourth is the Teacher’s Pet feature. Check out all the details of this fantastic game in the full Miss Fortune slot review below. While she may not have made the teacher’s roll at Hogwarts, the Miss Fortune slot certainly looks set to win a place in the hearts of all Harry Potter fans thanks to a fantastical video slot developed by Playtech. Featuring five reels and 25 paylines, the Miss Fortune slot machine is a visual tour de force, with the eponymous teacher appearing beside the game board in gloriously rendered 3D and the action unfolding in a torch-lit lecture hall. 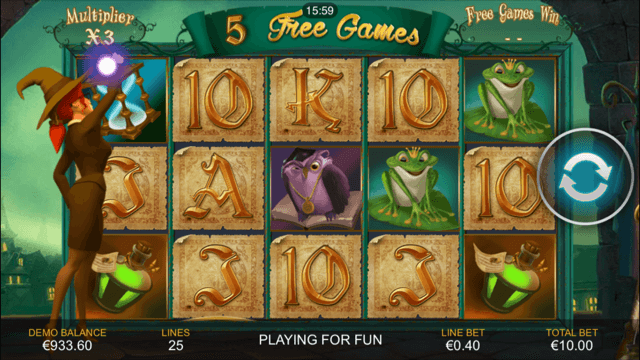 Unique icons to appear on the reels include Miss Fortune herself, owls, frogs, potions and sand timers, while crystal balls can be collected for free spins and a dragon triggers a picking feature. Playable from as little as £0.25 per spin, Miss Fortune can be enjoyed across all desktop, mobile and tablet devices and offers players the opportunity to win up to 5,000x their bet per line on amount on any given spin. The game includes two main bonus rounds, with players technically able to collect an unlimited number of free spins if they land enough Miss Fortune scatter symbols in the base game. Before we get started on the game’s two main selling points, however, we should first take a look at the Crystal Ball Re-Spin mini-feature, which is triggered whenever a player collects three wild symbols. Whenever this happens, they’ll be given a complimentary re-spin, with the three stored wilds also being added to the reels to hopefully help them on their way to some magical payout combinations. Moving on to the full features, collecting a dragon symbol on reels one, three and five simultaneously will trigger the Teacher’s Pet bonus round. Here, players will receive 10 picks from a selection of lockers, with a cash prize being awarded whenever they successfully locate Miss Fortune’s pet dragon. Finally, the game’s star attraction comes in the form of a free spins feature that is triggered by landing three scatter symbols anywhere in view. This will award a base amount of seven bonus games, but the twist here is that whenever players land two scatter symbols, another free spin will be added to their total when the feature is triggered. Furthermore, each spin will be subject to 2-10x multiplier. Featuring state-of-the-art graphics and some enjoyable bonus features, the Playtech slots team have certainly done their homework while designing the Miss Fortune slot and the result is a slot that finishes top of the class. Like the Miss Fortune slot review? Check out these as well…..